A great looking power bank with THREE USB ports!!! Hey there. Time to reach into the vault o'stuff and pull out another great device to test out and review! 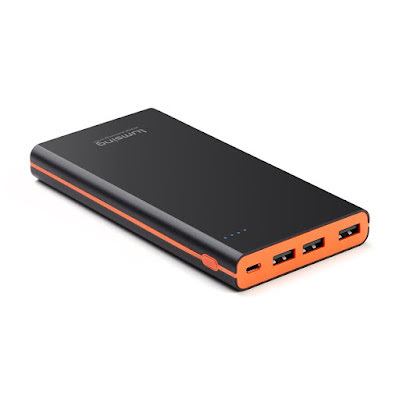 The lucky item this time around is the Lumsing Glory P1 Plus 15000mAh External Power Bank! Our good friends over at Lumsing were awesome enough to send me one of these great power banks to try out and review. Power banks are simply awesome. Honestly, I don't know how I survived without carrying one of these everywhere I go. Seriously, we are so connected in this day and age that a power bank is almost a necessity. The last thing you want is be out and about and have your trusty device run out of juice! And even though there are many choices out there, let me tell you why you should consider this particular power bank from Lumsing. But before I do, let's talk specs! Once I received the Lumsing Glory P1 Plus, I wasted no time cracking that box open to check it out. But just to touch on the box real quickly. The box that the Lumsing power bank comes in is just a standard brown box with little going for it. A simple outline of the power bank and the name of the device is all that adorns the front of this plain, ol' brown box while the back of the box lists a few specs. I think I've become spoiled by other tech companies that have some pretty awesome boxes, but I'm going to assume that having a simple box reduces costs, ultimately, resulting in a lower price for the item. Just a brown box, guys. Nothing special there. Trust me! Anyways... I opened it up and pulled out the power bank. Oooo.... It is a lot lighter than I anticipated and the design is pretty sleek. Other power banks that I own have gotten the job done, but are relatively "blocky" looking. Nothing short of a black brick in one case, but what I'm trying to say is that they are not all that pleasing to the eye. This Lumsing, power bank, though, is different. The design is pretty slim, it's mostly black but has the orange trim, that makes it more visually appealing, and feels relatively good in my hand. The rounded edges makes all the difference and gets rid of that brick look. Great job, Lumsing! After a quick inspection, I didn't see anything weird or out of the standard. I saw a few lights for power indication and a single button on the side. Also, I was glad to see that it has 3 USB ports. Wait... 3??? The back of the box clearly states, "...can charge 2 devices at the same time." Hmmm... I wonder if that's a typo since there clearly are 3 usable USB ports for charging. If the power bank can only charge 2 devices... why have 3 ports? Definitely need to test this. First, let's touch base on the indicator lights on the power bank. The Lumsing Glory P1 Power Bank has 4 indicator lights that will tell you approx. how much charge it has in it. 4 lights in total and each light is approx. 25% of power. You can check the charge in your power bank anytime by simply pressing the button on the side. While charging, the indicator lights will blink. The awesome part of the lights is that it also gives you a heads up as to how much is in power bank WHILE charging. So if 3 indicator lights are blinking, you are looking at the power bank being at approx. 75% charged. I really like that. You remember that I mentioned 3 USB ports? I quickly put that to the test to make sure that I can charge 3 devices at once. I can confirm, folks, that the Lumsing Glory P1 Plus definitely can charge 3 devices at once. I plugged in two smartphones as well as my Kindle Fire just to make sure and fortunately, it started to charge all three devices. I guess the box just has a typo. Now, as for the actual ability to charge... yeah, it's pretty awesome. While having the Kindle Fire and smartphones plugged in, I kept an eye on the charge percentage to see just how well the Glory P1 does. Having three devices charging would surely make the power bank charge slower, right? It would cause some kind of slowdown, right? I was skeptical, but that was quickly brushed away in less than an hour after use. The 2 smartphones were charged up almost completely and the Kindle Fire was charged up more than halfways. Now, that may not sound like much, but that's actually pretty good. All three devices were on and the Kindle Fire and one of the smartphones were in use during charging. I have come across a few power banks that WILL NOT charge a tablet if it is in use!!! The charging symbol would be displayed, but the power bank simply was not strong enough to actually charge the tablet while the tablet is in use. I was super happy to see that the Lumsing Power Bank actually charged it up while in use. This thing definitely follows through on the smart charging technology that it boasts! Also, the high capacity power reserve is no joke on the Lumsing P1 Glory Plus. I have been able to fully charge my smartphone 2 times over when only 1 of the indicator lights is on. Keep that in mind, the Glory P1 is telling me that it has less than 25% of juice in it and it still will charge up my smartphone two times over!!! That's freakin' awesome! Let's be honest here, friends. We tend to forget to charge our devices. Whether it be our phones, music players, video players, tablets, and even power banks... But would it be awesome that if you forget to charge your power bank, it may still hold enough power to at least charge you up a few more times? I was disappointed when I first came across this scenario. Based on previous experiences, once I saw that single indicator light, I knew that I couldn't depend on that power bank to fully charge my smartphone. So you can imagine my surprise when I was able to continue to charge my phone when only a single indicator light is on while using the Glory P1!!! If that isn't enough to get you to buy this, I don't know what will!!! I work wherever I can so it's pretty awesome to have a trusty power bank wherever I go! Now, I wouldn't be doing my job if I didn't mention any shortcomings. The only thing that the Glory P1 power bank cannot do is charge a device while being charged. I know, I know... it's not a big deal and you may even wonder why you would charge a power bank and have that charge up a device. You might as well just charge up the device directly, right? Well... the reason why someone might want to, "piggyback", a charge like that is because you can connect several devices to your power bank and use only one charging port. Some other power banks allow that, the Glory P1 does not. If the Glory G1 is plugged in to charge, it will not charge any device connected to it. There really isn't much one can say about a power bank. In essence, it either works, or it doesn't. It does what it claims to do or it doesn't. The Lumsing Glory P1 Plus does what it claims to do and does it well. And let's not forget that it doesn't look like a brick! It is a great power bank that I am proud to have in my possession. The charging time to fully charge the Glory P1 may be lengthy, but it will definitely last you for several days! You can pick one up now at Amazon for under $25! So what kind of experiences have you had with power banks? Good? Bad? 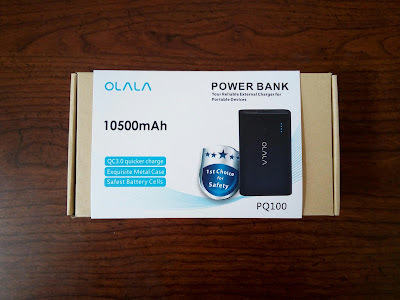 What do you look for in a power bank? 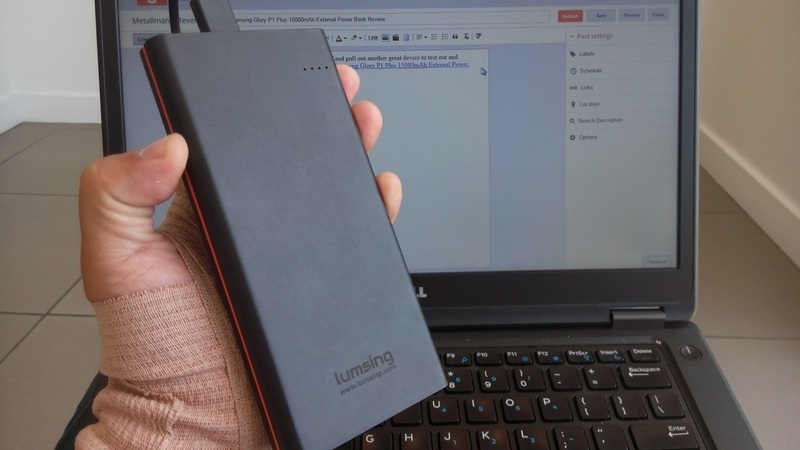 Does the Lumsing Glory P1 Power Bank fit the mold of what you want in a power bank? Let's hear it in the comments, friends! Later!